The Housing Is a Human Right Coalition is presenting to the Detroit City Council today at 1:00 p.m. its work to move homeless families into abandoned bank- and government-owned houses. The community is invited to this discussion on addressing the need for safe, affordable housing for homeless veterans, women and children; and improving the security and quality of neighborhoods across Detroit. Maureen Taylor, MWRO State Chair, will lead the Coalition’s presentation, including a history of the increasing homeless crisis in Detroit and the significant potential for addressing the economic and social costs through the City of Detroit’s Nuisance Abatement ordinance. 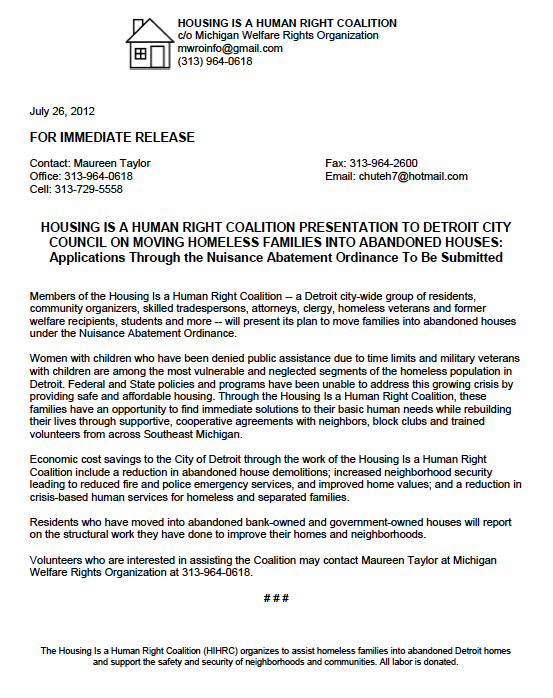 For additional information, contact the Housing Is a Human Right Coalition through the MWRO office at (313) 964-0618. 1 Comment on "Press Release on Detroit Housing Takeover Discussion"
This proposal of the MWRO is destroying neighborhoods. Whatever happened to the right to private property?